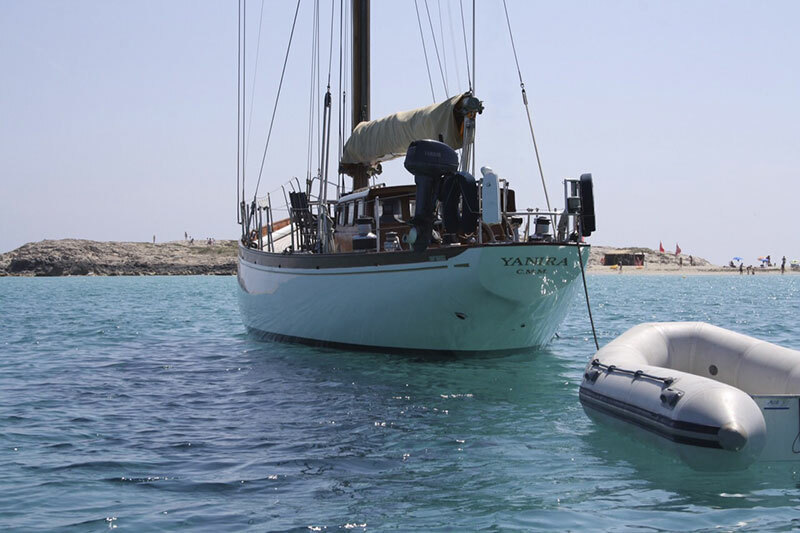 Consult our boats offer and enjoy a stay on board of a sailboat or motorized boat. We have the best Mediterranean flotilla. One day, a weekend, a week ? No problemos, we get used to each situation. With captain or without captain ? You decide. Wherever you are a professional or amateur captain ; or if you prefer hand over to a professional, you will find the best option in function of your needs. We have a group of professionals with a good experience. With them, you will forget all your worries and just enjoy the moment, the stay and your relatives. Costa Brava, Balearic Islands, Greece, Croatia, Cerdanya, Corsica..., just tell us where and when and leave the rest to us. Consult our costs and do not hesitate in asking us availabilities ! Bénéteau's fantastic 2016 motorized boats "Flyer 6" will be the stuff of dreams with its 6-meter length. With a maximal daytime capacity of 8 passengers, it is not possible to stay at night. Suzuki Motor 150CV. 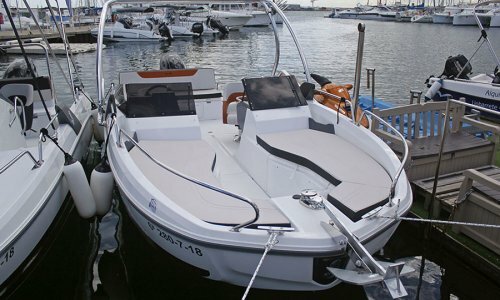 Perfectly designed ergonomics offer an optimum and dominant steering position, an ideal stowage arrangement for bow and stowage, wider side steps and easy access to the sea. The aft cockpit is comfortable thanks to its folding stool. This boat is just waiting for you ! 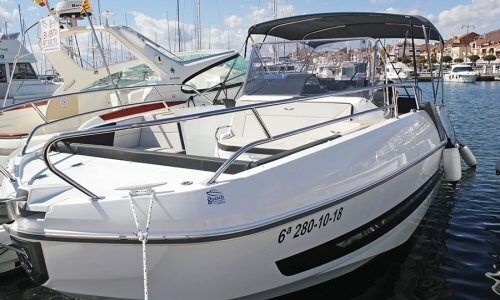 Based in Sant Carles Marina. Come stay on this beautiful boat with your family, friends or partner. Come sail on the sea in security and with comfort. Built in 2018, Bénéteau's fantastic motorized boat "Flyer 8 - Spacedeck" will be the stuff of dreams with its 9-meter length and almost 3-meter width. Suzuki Motor 2 x 250CV. With a maximal daytime capacity of 11 passengers, it welcomes 2 passengers by night (1 cabin). This boat is just waiting for you ! Based in Cambrils. Performance, pleasure and style. The new Flyer range is the result of a daring choice in terms of design and technology. Wide bow, profiled laterals struts and elegant windshield design mark the style of this outboard which stands out above the rest. Come stay on this beautiful boat with your family, friends or partner. Bénéteau's fantastic 2017 motorized boat "Flyer 7 - Sportdeck" will be the stuff of dreams with its 7-meter length and almost 3-meter width. With a maximal daytime capacity of 10 passengers, it is not possible to stay at night. This boat is just waiting for you ! Based in Cambrils. Suzuki Motor 300 CV. 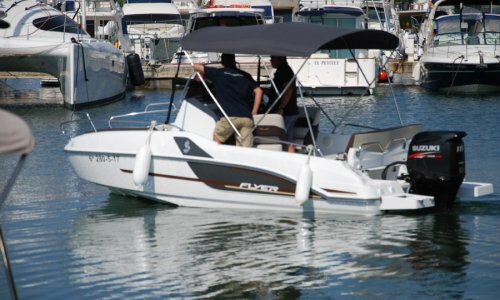 Impressive by the level of comfort it offers, the Flyer 7.7 Sportdeck accommodates on board up to ten people. 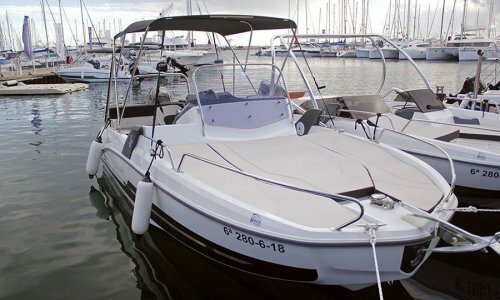 Its state-of-the-art Airstep© helmet offers fabulous driving sensations, this day-boat has a spacious cabin which allows to prolong the escapades at sea. Bénéteau's fantastic 2017 motorized boat "Flyer 7 - Sundeck" will be the stuff of dreams with its 7-meter length and almost 3-meter width. With a maximal daytime capacity of 10 passengers, it is not possible to stay at night. Based in Cambrils. Suzuki Motor 300 CV. Impressive with its high-level comfort. 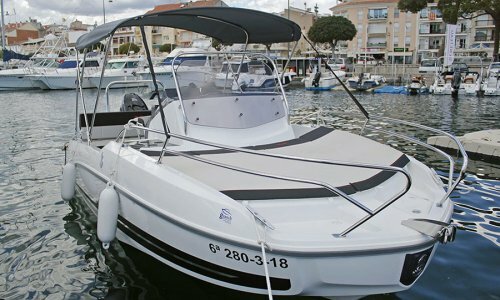 Its state-of-the-art Airstep© helmet offers fabulous driving sensations, this day-boat has a spacious cabin which allows to prolong the escapades at sea. Come stay on this beautiful boat with your family, friends or partner. This boat is just waiting for you ! Bénéteau's fantastic 2018 motorized boat "Flyer 7 - Mabre" will be the stuff of dreams with its 7-meter length and almost 3-meter width. With a maximal daytime capacity of 10 passengers, it is not possible to stay at night. This boat is just waiting for you ! Based in Cambrils. Suzuki Motor 300 CV. 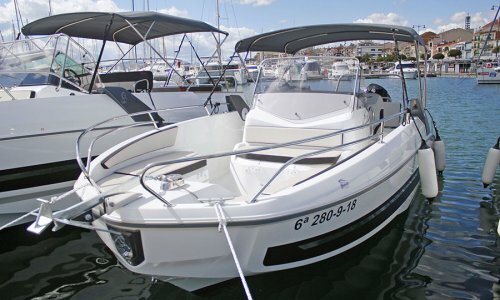 This is a dayboat for large families and stands apart for the exceptional availability of space. It offers incredible driving sensations and great safety underway. Bénéteau's fantastic 2018 motorized boat "Flyer 6 - Sportdeck" will be the stuff of dreams with its 6-meter length and 2-meter width. With a maximal daytime capacity of 8 passengers, it is not possible to stay at night. This boat is just waiting for you ! Based in L'Estartit. Suzuki Motor 200 CV. 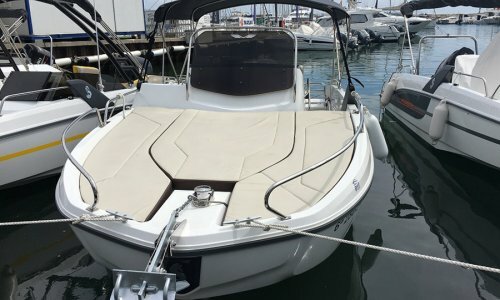 Bénéteau's fantastic 2018 motorized boat "Flyer 6 - Galera" will be the stuff of dreams with its 6-meter length and 2-meter width. With a maximal daytime capacity of 8 passengers, it is not possible to stay at night. This boat is just waiting for you ! Based in L'Estartit. Suzuki Motor 175 CV. Bénéteau's fantastic motorized boat "Flyer 5" will be the stuff of dreams with its 5-meter length and 2-meter width. With a maximal daytime capacity of 6 passengers, it is not possible to stay at night. Based in Cambrils. Suzuki motor 115 CV. Come take a sunbathe and chill under Barcelona's sun. This boat is just waiting for you ! 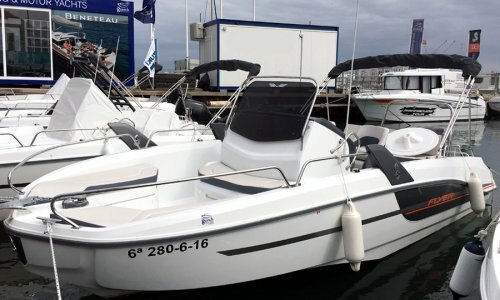 Bénéteau's fantastic 2016 motorized boats "Flyer 6 - Tonik" and "Flyer 6 - Eros" will be the stuff of dreams with their 6-meter length and 2.5-meter width. With a maximal daytime capacity of 8 passengers, it is not possible to stay at night. These boats are just waiting for you ! Based in Club Nàutic Sant Feliu (Costa Brava). Come stay on these beautiful boats with your family, friends or partner. Bénéteau's fantastic 2016 motorized boat "Flyer 6 - Eros" will be the stuff of dreams with its 6-meter length and 2.5-meter width. With a maximal daytime capacity of 8 passengers, it is not possible to stay at night. Suzuki Motor 75 CV. With a cockpit and an impressively large forward sun lounger, the Flyer 6.6 SUNdeck gives over 50m2 to sunbathing. Equipped with the latest generation of Airstep technology, this outboard speedboat offers cruising comfort second to none. This boat is just waiting for you ! Based in L'Estartit. Come stay on this beautiful boat with your family, friends or partner. Bénéteau's fantastic 2016 motorized boat "Flyer 6 - Tonik" will be the stuff of dreams with its 6-meter length and 2.5-meter width. With a maximal daytime capacity of 8 passengers, it is not possible to stay at night. This boat is just waiting for you ! Based in Port Olímpic, Barcelona. Come stay on this beautiful boat with your family, friends or partner. Bénéteau's fantastic 2015 motorized boat "Flyer 5 - Chivita" will be the stuff of dreams with its 5-meter length and 2-meter width. 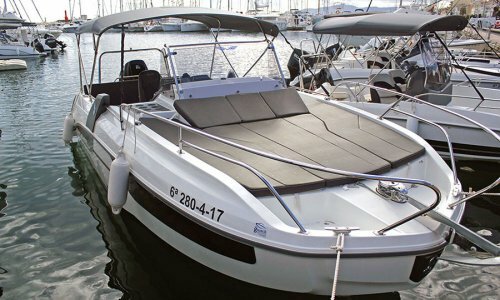 With a maximal daytime capacity of 6 passengers, it is not possible to stay at night. 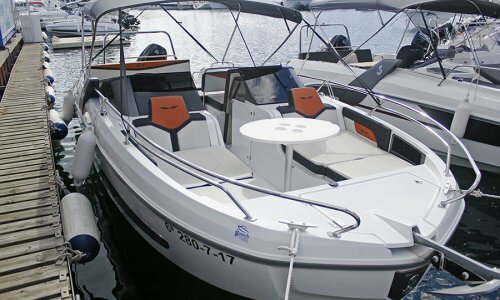 More familiar, this boat is characterized by exceptional on-board comfort in a unit of this size. Its two pilot seats, its wide aft bench, its solarium protecting a stateroom bow, destine to him to the pure rest.